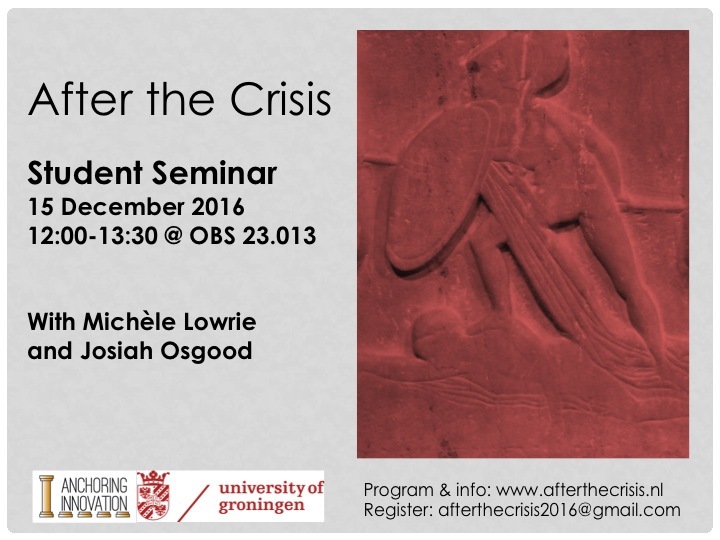 The After the Crisis team and Young Academy Groningen would like to invite BA and MA students of Classics and Ancient History to attend the After the Crisis Student Seminar on Thursday December 15, 2016 at Oude Boteringestraat 23, room 13 in Groningen. During the Student Seminar two of the speakers at the conference will briefly introduce their research, followed by Q&A and discussion. Students will get the opportunity to get to know two internationally renowned researchers in a small setting. Abstracts of both papers can be found here. Participation in the seminar is free, but registration is required via email at afterthecrisis2016@gmail.com Questions can be directed to the same email address.